Although service emerges from the station loop at Sussex Avenue, the measurements cited here are at Harbord Street. This is necessary because the GPS on some streetcars becomes “confused” about the location while underground and do no begin transmitting valid positions until they are south of Sussex. A similar problem with the Bay Street tunnel requires headway measurements at York rather than right at the tunnel mouth. An explanation of the format of all charts can be found at the end of this article. The following charts consolidate headway statistics from six points along the route for each direction on weekdays, Saturdays and Sundays. On each chart, the service to Union (measured at York Street) is shown in red (with the standard deviation in a dotted red line). Service south of King is shown both at King and at Lake Shore in green and yellow respectively. Service between Richmond and Spadina Station (measured at Harbord) is shown in blue, violet and brown. This clearly shows the level of service on the three branches of the route. What is immediately obvious here is that there is a considerable amount of service short-turning at King even during periods when there is no service scheduled to terminate there on weekends in December. In January, three services are visible in the averages even though only two are scheduled at all times. The line is, in effect, being run without a schedule and what the TTC advertises simply bears no resemblance to the service actually operated. This is of particular concern south of King where riders are short-changed relative to the service they are supposed to receive. In March 2016, the Charlotte Street Loop closed for construction for several weeks, and there was no option but to send all service further south. I will report on how the line actually operated during this period, as well as the following weeks when service was still allegedly to all operate at least to Queens Quay, in a future article. Note: January 1 and 2 are not included below as they operated with the “old” schedules. For new readers of these analyses, a description of these charts appears at the end of the article. Comparing the averages with the scheduled values shows that actual service is commonly not as good as the scheduled service. Cars are consistently not leaving the terminal as often as the planned headway. This problem did not disappear with the implementation of wider headways for service with the new streetcars on weekdays, but did improve on Saturdays. December weekdays AM peak through early evening: The scheduled headway is under three minutes, and for a good part of the day it is 2’13”. However, the actual headway crossing Harbord averages about three minutes. January weekdays: The scheduled headway is 3’20” for much of the day, but the average actually operated was over four minutes. December Saturdays: The scheduled headway is 2’20”, but the actual average exceeds three minutes. January Saturdays: The average headways are closer to, but still above, scheduled values than in December. This is not a case of some days with less than scheduled service offsetting other and diluting the averages. The trend lines for headways on all weekdays lie in almost the same place on the weekday charts showing that the service was, generally speaking, similar through the months of December and January. This begs the question of whether the line is being operated on a timetable at all, or simply being dispatched as cars are available, or at the discretion of route supervisors at the station. There is also a question of whether it is physically possible to push cars through the station at very close headways given the time needed to unload and reload. Anyone who rides the line knows that long waits to enter the station are common as cars are queued up behind those serving the platform. Another point to note in January is that the weekday standard deviation is higher, and headways well above 10 minutes are common. For a route entirely on its own right-of-way and so close to its own terminal, this is a troubling situation. Even under best case conditions, the TTC maintains neither its advertised level of service, nor a regular vehicle spacing. The situation northbound at Richmond is similar to departures from Spadina Station. The average headway is wider than that advertised on the schedule, and the range of headways is wider in January than in December. Weekends are particularly bad. Headways above 10 minutes are not uncommon. King Street is a logical point from which to space and dispatch service, but the actual headways at Richmond suggest that the merging service from the short turns at Charlotte Loop and the through service to Union was not working well. The standard deviation in values rose in January for weekday service indicating that service was less reliably spaced with fewer cars on the line than it had been in December. Another troubling point is that SD values grow during periods when scheduled headways are wider (weekend evenings). This begs the question of whether laissez-faire management when scheduled headways are short continues into periods when wider headways demand better on time performance (or at least regular vehicle spacing). In December, weekday service is split from the midday through to the early evening between Union Station, Queens Quay Loop, and Charlotte Loop (King Street). In theory, two out of three cars should continue south of King, and one in three should run through to Union. In January, the weekday service was changed so that half of the cars turned back at King and the other half operated to Union with no scheduled short turns at Queens Quay. Service south of King is very erratic with headways over 10 minutes quite common during all operating periods. The standard deviation values are routinely at four minutes or more indicating that many cars are running close to each other separated by wide gaps. The situation is similar for both months. Northbound service is even worse than southbound with the SD values closely tracking the averages. This means that pairs of cars are quite common. Headways from 10 to 20 minutes are common in a location where service should be much more frequent. During periods when half of the service is scheduled to Queens Quay Loop and the other half to Union, the pairing of cars shows not only that nobody is managing headways, but that the through and turnback cars are leaving close together northbound. This is the worst type of “service” where branches of a route supposedly blend together. Service to Union Station is even worse than on Spadina. In January, many weekday headways lie in the 10-20 minute range with a few beyond that level. Standard deviation values lie in the 5-6 minute range at which it is impossible for the TTC to achieve any of its stated targets for service reliability. Service westbound from Union shows the same pattern as eastbound. With two routes, Spadina and Harbourfront, sharing the loop, it is impractical for cars to space themselves out properly, and so the outbound headway pattern mimics the inbound values. Round trip times from York Street to Union Station and return are consistent through December and January with values around 8 minutes and a standard deviation usually under 2 minutes. Because 510 Spadina shares the loop with 509 Harbourfront, extended layovers at Union are not practical, and this leads to fairly uniform times over this segment. Times shown in these charts are measured from Sussex Avenue through the station even though some trips are missing due to GPS problems described above. 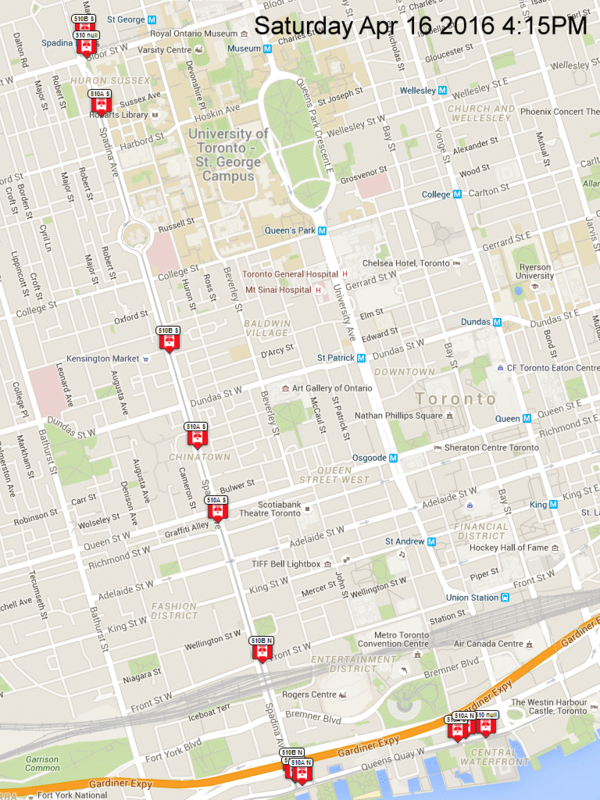 This minimizes any effect of the travel between Sussex and Harbord including stop dwell times. Unlike Union Station, Spadina Station Loop has a spare track where cars can lay over. The result can be round trip times to and from the loop that are quite long depending on how much time a car spends in the loop. There is a wide scatter of round trip values for this segment, and these throw off both the averages and standard deviations. Many cars make the trip in 5 to 8 minutes, but times up to half an hour are not unusual. There is some difference between December and January data in that the practice of holding cars at the station seems to apply to all-day operations in December, but more so to afternoons and evenings in January. This is another example of how the actual operation of the line is completely different from the official schedule. The reason for operating the route so much differently from the posted schedule becomes obvious when we look at trip times over the line. The charts below give the round trip times from Harbord to Union Station and return. From the terminal times above, we know that Union Station Loop does not contribute much variability through layovers, a situation completely different from that at Spadina Station Loop. For both December and January, this round trip averages about one hour through weekday daytime periods until after the PM peak, and similar times for midday and afternoon operations on weekends. At least 10 minutes is needed for a layover-free trip from Harbord to Spadina Station and return making the full round trip a 70 minute proposition. With a standard deviation typically running at 5 minutes, the majority of the round trip times will lie within a band from 65 to 75 minutes. This is greater than the scheduled time for round trips over the entire route (56 to 62 minutes), and it is impossible for cars to remain on time. The average speed of vehicles along a route seen at a fine granularity can reveal locations where cars are routinely held by congestion, traffic signals and stop service time. In the case of 510 Spadina, congestion as we usually know it does not exist because the route does not operate in mixed traffic. The two sets of charts below illustrate average vehicle speeds by hour for the weekdays in the middle of January 2016. Stepping through the pages provides a “flip chart animation” of the evolution of these values from 6:00 am until after midnight. In both charts, Union Station is at the left and Spadina Station is at the right. The vertical scale is in km/hr. Where there is a “notch” in the chart, this will be a location where vehicles move slowly or stop, and these will usually be at stops or intersections. The degree to which cars are held southbound approaching College, Dundas and Queen. All of these have farside stops, but cars slow on the approach to the intersection (often stopping as regular riders know), then the average speed goes up as they cross, and then it drops again at the stop. There is no transit priority at these locations. The section from Richmond to King is particularly slow because of the combined effect of the signal (and some streetcar turns) at Adelaide and the nearside stop at King. Operation between Spadina/Lake Shore and the entrance to Queens Quay Loop is consistently slow both because of the traffic signals and the eastbound stop. Average speeds on Queens Quay are slightly higher than on Spadina probably because stops are further apart, and there is some transit priority in the traffic signals. Reading the northbound stats, think of the vehicles as moving from left to right across the page. As with the southbound service, operation on Queens Quay is a bit faster than on Spadina. The Spadina/Queens Quay area is a location of slow operation northbound as it is southbound. Cars operate slowly on average northbound to Bremner where they are often held by the traffic signal and then cross to serve the northbound farside stop. The average speed north of Bremner is at times higher than the speed to the south showing how the traffic signal works against the transit service. A similar problem exists northbound at Front. King, Queen, Dundas and College all show the effect of cars held nearside for traffic signals and then again for stop service farside. Four or five pages plotting the values for weekdays that are not statutory holidays. Each dot represents one value (a headway or a trip (or “link”) time), with a separate colour for each day. The trend line is interpolated for each day’s data and to the degree that these lines lie on top of each other, this shows the similarity (or not) in day-by-day operations. One page consolidating all of the weekday data points. The purpose of this is to show the overall shape as a “cloud” and in particular the degree of scatter in values. One page each for the Saturday and Sunday/Holiday data in the same format as the weekday charts. One page for each of weekday, Saturday and Sunday/Holiday data giving monthly averages and standard deviation values calculated on an hourly basis. Note that weekend values can be more “spiky” because there are fewer observations within each hour, and so one delay can have a bigger effect than with the weekday values. To the degree that values are tightly clustered around the trend lines, the values don’t vary too much, and most observations will fall close to the average. This shows up also in low values for the standard deviations. Conversely, when the data points are spread out, this shows that headways are erratic (long and short values being as common as average ones), and the SD value can rise close to the average. In that situation, service is generally operating as pairs of vehicles (or worse) separated by gaps in the case of headways. For link times, a low SD value and tightly clustered values show that the travel time is consistent, or not. The ideal in the case of both headways and link times is that SD values be low and observed values stay close to the average. For a full description of the process by which I have analyzed the TTC’s vehicle tracking data, please see Methodology For Analysis of TTC’s Vehicle Tracking Data. The endpoint issue will never be resolved until the TTC realizes you can’t regulate service at the platform – there are too many variables (loading time, gaps in front and behind). The regulation should happen after loading is complete – in the tunnel. Loading time can then be forcibly shortened if the tunnel queue=0 and there is >1 vehicle in the platform queue – either by not loading it, or shutting the doors before everyone is loaded. This is how airports do things, you don’t get put in the takeoff queue until you leave the gate. But you can leave the gate early if there is room in the takeoff queue. Was it ever determined if is possible to modify the platform at Spadina to allow for two LRV’s at the same time? Steve: I will ask about this again. And when they did rebuild the platform recently, I noticed that it is still low enough to require the full length of the wheelchair ramp, I would have thought it would have been the same height as the on street platforms, is there any reason for this? Steve: Changing the platform height would have affected the approaches to the boarding area and there isn’t much room to do this between the top of the stair/escalator well, the elevator exit, and the platform. It would probably be too much of a change in a short distance for an acceptable gradient. But you fail to analyse the delays that happen waiting in tunnels when a million street cars are lined up at Union station and Spadina station. It’s often faster to get off at Sussex or Front and walk. Spadina with it’s own reserved lanes was supposed to be rapid transit but it’s not and this is why we don’t want streetcars in Scarborough even in their own lanes. The streetcar tracks on Eglinton Ave East in Scarborough must be removed ASAP. Steve: These are two completely separate issues. I was planning to turn to the delays at the terminal as part of a second article looking at operations in March/April. I already did make the point about Spadina Station having long terminal times. I have to subdivide the round trips into approach queue, platform time, and departure. If you are going to turn every issue into “we don’t want streetcars in Scarborough”, well, you won’t get much sympathy from me. The problem at Spadina Station (and to a lesser extent Union) is the same problem that causes backlogs of subway trains, your favourite mode, at terminals — they arrive before there is any place to put them, and the trains in the terminals sit on the platform too long. If it had been raised, it would have had to be tapered down lower at each end of the platform to allow for the lead/tail swing of the ALRV’s and CLRV’s as long as they are still on the system. (along with the two PCC cars) This, of course, would leave different enter/exit heights on the front and rear doors of the LFLRV. As for the lengthening of the platform at Spadina Stn, I had heard some time ago that there were plans for the removal of the four or five glass panels at the west end of the platform, between the pillars but I’m guessing that the tail swing on the older cars would again be a safety concern in the pillar area. Actually, after the ALRV’s started service on the Spadina Line the supervisory staff at the Stn started a system where the LFLRV’s that pulled up to load, would stop with their front door just past the end of the platform. With no passengers on the car, the operator opened all the doors, then closed the front door, loading with the three sets of rear doors. This worked just fine, with one LFLRV loading and one LFLRV unloading at the same time. Apparently, the powers-to-be decided “NO” the passengers really would rather sit in a packed streetcar in the tunnel until there is room at the platform. Too bad a little more effort wasn’t put into a way to make this loading and unloading system work which would benefit the passengers and speed up the service. I have ridden the 510 regularly during the week, normally during pre rush hours (6-7am) in the morning going south from Spadina and rush hours (4-6pm) going north from Sussex ever since the 510 streetcars came into service. I believe the new Flexity has assisted (especially looking at the northbound component, north of College) generally in net transit times. But as others have commented, the regularity of service is terrible. With the help of a Smartphone App, wait times at Sussex are predicted to be over 6min, even at 3pm. Walking north is clearly a better/faster path. During that time, 3 or 4 cars come out from the station, heading south. This is during relatively light passenger and auto traffic. I have no idea why this line is in general so dysfunctional, given it has a dedicated right of way. The TTC does not seem to have the means to engineer this important line so to regulate wait times and net transit times. I must say that one starts to wonder whether the TTC actually needs a ‘scheduling department’ or ‘route supervisors’ as this lack of any real relationship between what is advertised and what is delivered seems pretty constant in all of your route analyses. Maybe it would work just as well (or badly) if they just send x operators out on route y and tell them to be sure to be back at their home base when their shift ends to avoid any overtime. There are a few big differences between transit and planes. Passengers arrive at the airport at least 30-60 minutes before their flight, so leaving 15 minutes early is seen as a positive. If you were to show up at your bus stop 1 minutes before the “departure” time only to find out you need to wait half an hour because the bus left 2 minutes early, that is not a positive. Basically, you need to allow any early departure variation into your travel time. This makes it equivalent to “late” departures from a given time. On high-frequency lines, timing is less important than headways. On low-frequency lines, timing is more important than headways. I personally would draw the line at 5-minute headways, but it would make more sense with the TTC’s 10-minute network to group them all as “schedule free”, but with managed headways. Regarding Spadina specifically, it seems like loading/unloading time may be the chokepoint. If so, headways could be better managed by not loading every inbound streetcar. I’m not sure of the existing ratio of capacity to ridership, but you might get an 8% improvement by having every seventh streetcar leave without boardings. I don’t think there is any real schedule, despite the ever-present supervisor with his pen and notebook on the platform at Spadina station. Around 5 pm there are long gaps between the streetcars on Spadina, probably due to both the high number of passengers and all the traffic lights. I have often waited as long as twenty minutes for a streetcar to arrive (at College) and then it is too crowded to board. I usually have to let three or four cars go until I can get on one. At times I’ve waited for as many as eight. Yet there is always a regular stream of cars heading south. faulty principles in tax assessment at Municipal Property Assessment Corp.
UPX is a financial failure. I predict that the Crosstown LRT will meet with disapproval in Scarborough because it reduces Eglinton to 4 lanes and prohibits [left] hand turns. In August of 2014, two lanes of Eglinton were closed between Midland and Brimley, for water main refurbishing, resulting in St. Clair and Lawrence being turned into parking lots. The Liberal government will be adding Metrolinx to the list of inadequate management oversight responsibilities. Steve: And the irony on Eglinton is that there is room to widen the road, but so far they have been too cheap to go that route. I think the headways will improve with buses precisely why world class cities like New York, Chicago, Hong Kong, Seoul, Tokyo, Berlin, Mogadishu all got rid of this antique technology. Steve: Oddly enough NYC plans to reintroduce streetcars, HK still has them, Berlin only discontinued them in the western sector because the carhouse was trapped in the eastern sector. And why in this august list of cities does Mogadishu rank mention when you omit places such as Vienna, Moscow, St. Petersburg, Milan, Rome and many others? So when you share this with the TTC what do they say? It seems the advice to manage by headway not timetable has been consistent for years – and would give better service. Why haven’t they even conducted a large scale trial and continue to insist on even producing a (fictional) timetable? From the TTC’s perspective why won’t they do something? As to timetable vs headways, this is a big debate. Because work assignments are based on timetables, there is a big incentive for service to run “on time”. Otherwise operators do not finish their shifts on time (causing overtime pay), but equally importantly things like scheduled breaks and changeovers between crews cannot be planned because without a timetable, nobody knows exactly where operators will be from hour to hour. Spadina is a short enough route that the crewing requirements of timetables and the “run as directed” style that appears to be in use at least during busy periods can co-exist. This would not work on a long route such as Queen. Moving to a headway-based scheme will require a complete rethinking of what a “crew” consists of and the way in which breaks and changeovers are managed. For full disclosure purposes, Steve has stated in the past that he does not get paid for anything on his blog. For full disclosure purposes: Steve, are you or have you have been on TTC’s payroll? For full disclosure purposes: Steve, are you or have you have been on the city’s payroll? Steve: I have been paid by the TTC for analytical work done on the City’s downtown streetcar studies. This was a limited term engagement as a freelance consultant. I have never been on the City’s payroll. I was on the TTC’s payroll from September 1966 to August 1969 in a junior position unrelated to my work over 40 years later. The opinions on this site are my own and are not in any way influenced or dictated by the TTC, the City or any other agency. Anyone who reads this site regularly should know I have a healthy disrespect for the “official” version of just about everything. My scathing opinions of Rob Ford, the Scarborough Subway, and other boondoggles are entirely my own. Thanks for this — interesting as always, and frustrating (as it often is). Semi-related question: is there a reason the Flexity fleet isn’t using pantographs yet on Spadina? Steve: I believe the intent is to not use pans until all overhead they might encounter (including diversions and carhouse trips) is converted. 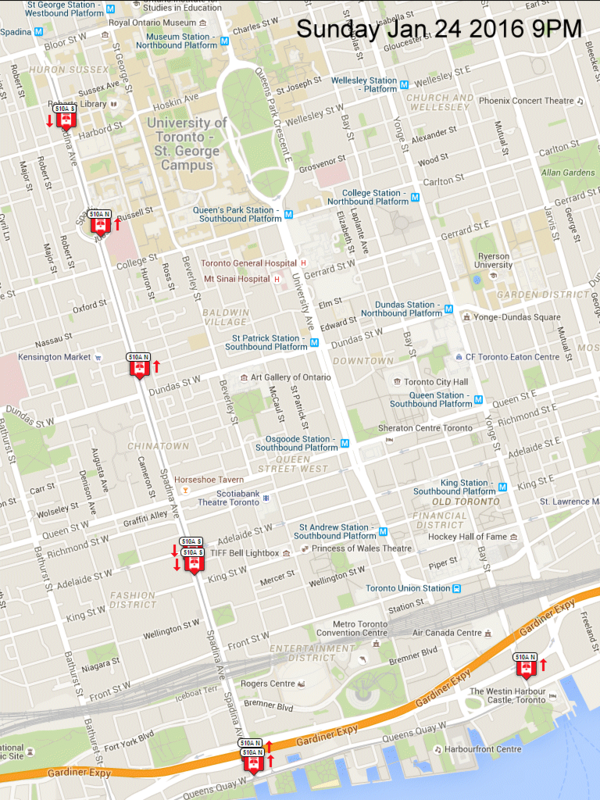 Here are a couple of visual maps to give people an idea of what a normal day on Spadina looks like. Note the pairs running together and the large gap between SB King and NB Queens Quay station. Advertised headway is 6’45”. On a Sunday afternoon, half of the cars on the line are south of Lake Shore and there’s a huge gap of 12+ minutes from NB Front to Spadina Station. Advertised headway is 3’38”. Apologies, I had a brain fart and forgot the img tag wasn’t accepted for posts. Half of the cars on the line are south of Lake Shore and there’s a huge gap of 12+ minutes from NB Front to Spadina Station. Advertised headway is 3’38”. Steve: Yes, this is extremely common and says a lot about how poorly the route is managed. I plan to update my review of the route with more recent data, but have other things in the queue first. Do you know why this is not easily fixed? I would imagine a few small (and free?) fixes like this would be enough to bring a noticeable improvement to the line (and others). Wondering why this is left to linger? Steve: I think that the TTC and City Transportation would like to fix things like this, but (a) don’t necessarily devote the resources to monitoring what works and what does not, and (b) do not always agree on the appropriate “fix”. Bremner is a particular problem because it is effective part of the westbound approach to the Gardiner on ramp at Spadina, and it gets a lot of green time. There is a general problem on intersections around the Gardiner due to the amount of green time devoted to auto traffic while there is little or no transit priority.